Canned tuna is a healthy and convenient option to fresh fish, providing the same good low-calorie source of protein, important nutrients and heart-friendly omega-3 fatty acids. That's likely the reason that canned tuna is the second most popular seafood product in the U.S. next to shrimp. The USDA recommends that you include fish in your diet, but it's important to know what kind of tuna is safest to eat and in what fish serving size. Due to the risk of mercury poisoning, eating tuna every day would exceed the amount recommended as safe by the FDA. How much depends on the type of tuna you eat. 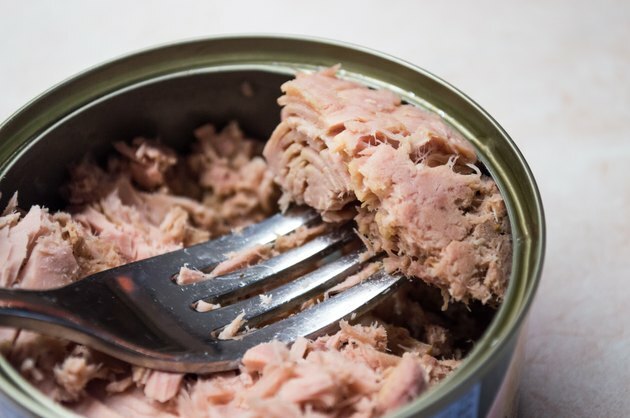 Canned light tuna contains the least amount of mercury, and the FDA suggests limiting yourself to no more than 12 ounces a week, or no more than four 3-ounce cans. Tuna fish are members of the Scombridae family and are commercially fished worldwide, both in tropical and subtropical seas. Of the many species, canned tuna comes almost exclusively from two types of tuna. Skipjack is a relatively small fish and the most abundant and widely fished tuna of the species. About 70 percent of the canned tuna in the U.S. is skipjack. It's often called chunk light or flaked tuna and is canned in water, brine or oil. Albacore is a larger fish than skipjack, often growing over 4 feet in length and weighing almost 90 pounds. Its pale meat is prized for its delicate, mild taste. Albacore is the only type of tuna that's allowed to be labeled as "white" in premium canned tuna. Approximately 30 percent of the canned tuna consumed in the U.S. is albacore. Fish is a good lean protein, low in saturated fat and the best source of healthy omega-3 fatty acids, so including tuna in your diet is a good thing. All fish contains some mercury. You simply need to be aware of which ones have the highest levels to avoid mercury poisoning. So how does mercury get into the fish you eat? Mercury occurs naturally in the environment — such as from volcanic activity — but industrial pollution can also contribute to mercury in the air. Mercury is deposited into rivers and streams and ultimately ends up in oceans around the world, becoming methylmercury, which can accumulate in the flesh of fish over time. The largest fish that live the longest and are highest on the food chain contain the highest amount of mercury, according to the Department of Environmental Conservation. According to a 2017 report by Environmental Toxicology and Chemistry, mercury levels in many fish unfortunately continue to rise each year. In an effort to help consumers reduce mercury exposure while enabling them to achieve the health benefits from eating fish, the U.S. Food and Drug Administration devised a chart that lists the fish species as "best choices," "good choices" and "choices to avoid," based on their mercury content. Each of the categories has specific recommendations for safe consumption, even for pregnant women and children. How Much Canned Light Tuna? According to the FDA, canned light tuna, made primarily from skipjack, is recognized as a fish with low mercury levels and is designated as a "best choice." This means that you can eat two to three servings a week, or about 8 to 12 ounces. That number of servings also applies to women of childbearing age — 16 to 49 years — as well as pregnant women. Fish Serving Size: An adult serving of fish is the amount that fits in the palm of your hand, or about 4 ounces. Therefore, the recommendation would make eating three to four 3-ounce cans of light tuna a week safe for adults. How Much Canned White Tuna? Because albacore, or white tuna, typically contains three times more mercury than canned light tuna, the FDA has included it in the "good choices" category. That means the recommendation is one serving per week or 4 ounces for adults — a little more than one 3-ounce can of white tuna per week. How Much Is Safe for Children? Feeding your child protein-rich light canned tuna is beneficial for growth and development. The FDA recommends serving fish to your children one to two times per week, using a variety of fish. But it's important that the portion size be correct according to the child's age and total calorie needs. Fish Serving Size: On average, a serving size for children, ages 2 to 3 years, should be about 1 ounce; for children, ages 4 to 7 years, the recommendation is 2 ounces; for children 8 to 10 years old, a serving size is 3 ounces; and for children 11 years and older, it's 4 ounces. The recommendation set by the FDA for the amount of fish that's safe to consume is intended as a general guideline based on the average weight of the American population. If you're an adult who weighs less than the average (165 pounds), you may opt to eat smaller portions or limit your intake to two servings of fish a week instead of three. If you want a more accurate indication of how much tuna you can safely eat per week, take a look at the tuna calculator created by the Environmental Working Group. It allows you to enter your weight, age, gender and whether you have a heart condition. Based on that information, you can get suggestions for the type and amount of fish you can safely eat, along with the mercury content and sustainability information. What's the Standard for Safety? Mercury content standards for consumable fish are regulated for safety. The threshold for a safe level of mercury in fish was determined to be 0.15 parts per million or less; moderate to high levels can range from 0.16 to 0.46 parts per million. Any fish with mercury concentration over 0.46 parts per million is not considered safe for consumption, according to the EPA. The level of mercury in a can of tuna may vary somewhat, depending on the age of the fish, its size and where it was caught. Averages have been determined for each species of fish, which form the basis for regulations and recommendations on safe amounts to eat. The average mercury concentration of canned light tuna is 0.13 parts per million, and canned albacore chunk white tuna is 0.35 parts per million, according to the EPA. Tuna packed in water contains fewer calories and less fat, helpful if you're trying to maintain your weight. For comparison, one can of white tuna in oil, drained, contains 331 calories and 14.4 grams of fat; a can of white tuna packed in water, drained, contains 220 calories and 5.1 grams of fat. Comparing light tuna, a can packed in oil has 339 calories and 14 grams of total fat, while a can packed in water contains 191 calories and 1.4 grams of fat.